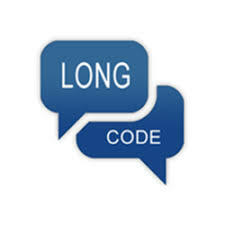 A Long Code is a standard phone number that is used to send and receive SMS and MMS messages. In countries that use the North American Numbering Plan (NANP) a long code is 10 digits. The number of digits in a long code will vary by country where they are not using the NANP. A long code is what most of us use when sending messages from our mobile devices to other people’s personal mobile devices. This is called P2P (person-to-person/peer-to-peer) messaging. Is There Another Way To Send Messages? There is another form of messaging called A2P (application-to-person) messaging. This is where the messages originate from a computer system, rather than from a personal mobile device that communicates over the mobile network and has a SIM card. A2P services can use either long codes or short codes to send and receive messages. There are different technologies and regulations for sending messages depending on whether you are using a long code or a short code. For example, when sending with a long code, the sender is limited to 1 message per second. Automated systems that use short codes can send up to 100 messages per second. There are also many different rules regarding Spamming and Phishing sending SMS messages. The rules are different whether messages are sent using long codes or short codes. Why Use a Long Code? It is easier and less expensive to set-up long codes than short codes. Also, less restrictive opt-in policies allow you to leverage more of your customer database. Perhaps the best reason for using a long code is marketing. Your main telephone number can be used as a long code when using a service like MessagePro Office. Therefore, you can send a receive text message and voice calls using the same number. This is great for branding, and also removes the need for your company to send and receive text messages from personal mobile devices. You manage text messages more like emails when using the MessagePro Office. You or any authorized employee can access text messages via any web browser or through the MessagePro mobile app. Messages are not stuck on your phone or the phone any individual employee. MessagPro can also be set-up with autoresponders so that it is quick and easy to answer frequently asked questions. You can sign-up for a free MessagePro Office account here.